Kambel Smith with some of his architectural models in progress at his home in Philadelphia's Germantown section. 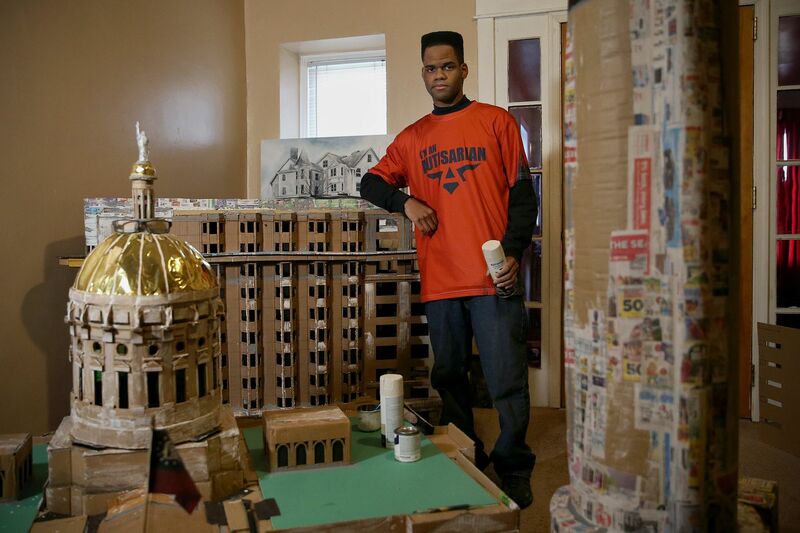 Meet Kambel Smith, a 32-year-old self-taught artist with autism whose large and intricate cardboard sculptures of Philadelphia buildings are gaining attention in the art world. Talent finds a way: Kambel created hundreds of oil paintings before his dad could no longer afford the expensive supplies. Undeterred, Kambel grabbed cardboard from the trash and started to create sculptures of iconic Philadelphia buildings like the Museum of Art and the Divine Lorraine Hotel. The art of patience: Kambel spends at least seven hours a day carefully creating his sculptures, according to his dad, Lonnie Smith. “Sometimes I can’t even watch him do it,” Lonnie said. “The patience it takes ... it will just drive me nuts." As Lonnie Smith was fixing a vent in his home about 20 years ago, his son Kambel’s drawings — crumpled and perfect — came tumbling out. The drawings Kambel had hidden in the vent told the story of a superhero character he named Survivor. But more important for Lonnie — who had struggled for so long to understand his autistic son — they told Kambel’s story too. Based on those sketches, Lonnie began telling a story to Kambel and his younger brother, Kantai, who is also autistic, about how autism is a superpower, not a disorder. That story, The Autisarian, is one the single dad and his sons still tell one another to this day. Paintings by Kambel Smith hang in his home in Germantown. Kambel Smith moves a cardboard model of the Flatiron Building in Atlanta out of his home. Gettes posted photos of Kambel and his work on Facebook and was able to connect him with curator and gallerist Chris Byrne, cofounder of the Dallas Art Fair and owner of the Elaine de Kooning House in East Hampton, N.Y. The materials Kambel uses and the scale of his sculptures “made my jaw drop," Byrne said. The American Folk Art Museum even acquired Kambel’s sculpture of the Divine Lorraine Hotel for its gallery, and the West Collection, housed at the financial services firm SEI in Oaks, purchased Kambel’s sculptures of City Hall and the PSFS Building. “It’s really inspiring,” he said. “Keep me going. Keep moving forward." “He’s an artist," Lonnie said. “He just happens to be autistic." Kambel Smith (left) stands with his brother, Kantai, and father, Lonnie, at their home in Germantown. Lonnie said the most important thing other parents of autistic children can do is try to uncover their child’s hidden talent. “Find the gift because I think all of them have it," he said. A GoFundMe page has been set up to raise money for an art an studio for Kambel. Wynnifred Franklin, 94, works up to six days a week at a Giant bakery in Montgomery County — and loves it.